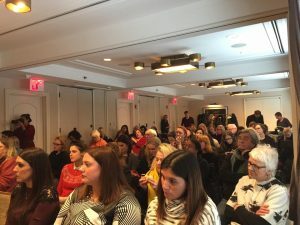 Our Trading on the Female Body event yesterday in New York was a terrific success. Before the event even started, we had to bring in more chairs, and we ended up with people standing in the back and sitting on the floor down the sides. Both panels did a wonderful job, and the audience was engaged and asked terrific questions of the panelists. The online audience, too, was very engaged, sending thumbs up, angry face, and heart emojis as each person spoke. The video is posted on our Facebook page and YouTube channel, and embedded below. Please watch and share! Thank you to all who came out to be with us in person, to those who watched on line, and to those whose generous support made this possible. THANK YOU!! !